Nothing beats tennis in the summer! Be a sight for sore losers and sore eyes, and cool the court down in trendy blue crews and shorts from FILA, Ellesse, and K-Swiss. I’m sure you guys grew up wearing FILA and K-Swiss, but Ellesse is an established Italian brand that’s new to Tennis Express. All three athletic collections, available online now, feature cool shades of blue for balance during hottest season. If you like a primary palette when you hit the court then the FILA Legend Collection is your winner. All of the tops come in only two shades of blue. The texture of their light blue is lightweight and smooth to the touch, so your clothing won’t feel heavy when you glide across court. Along with a great feel, the textural quality also glistens. On the Legend Tennis Polo, FILA’s contrast binding makes the horizontal stripes stand out. They get the same success with horizontal color blocking on the Legend Stripe Tennis Crew in Navy and Navy Heather. 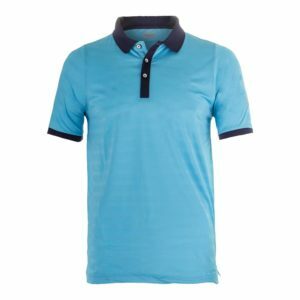 What’s helpful is that you can stay centered with the moisture-wicking and anti-odor characteristics of this classy tennis top. 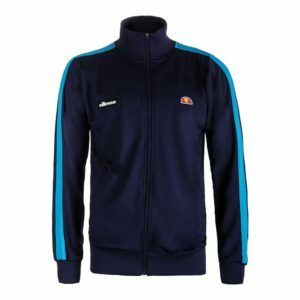 The baby in store, Ellesse, totally has their own way of making a retro look tournament appropriate. Like FILA they stick to a two tone blue palette. 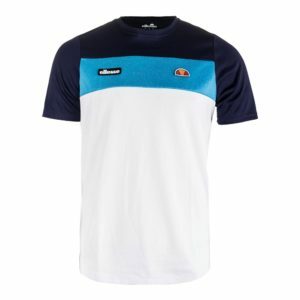 Their use of two logos, one raised and one an Ellesse print, makes you look as official professional tennis player Feliciano Lopez. Their range of styles in one collection gives you more uses for every piece! 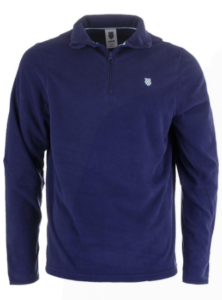 The Ellesse tone of cool blue is electric and more of a saturated color against their navy. 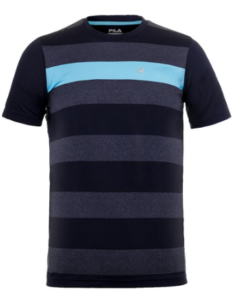 Color blocking is a huge trend from the past that’s repeating again here in the Merlo Tennis Tee in Navy and Blue. Tournament players can be prepared for warm ups and cool downs in full matching outfits from top to bottom. Guys that choose to keep it classy with K-Swiss will look forward to the mature mood of the Summer 2017 Collection: K-Swiss is sharing shoulder accents and three different solid blues, which is one more color option than FILA and Ellesse. The blues K-Swiss came out with this season are soothing, pastel hues and stand out compared to the previous brands as well. 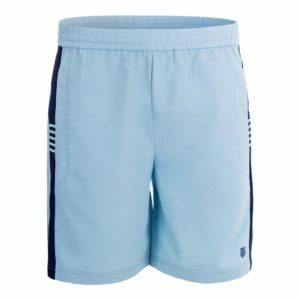 They also give you the advantage with the choice of three different color shorts that all include an elastic back waistband and a drawcord for a secure game. So your calm and smooth court attitude remains superior. For the ultimate boss look, walk away from any win in comfort wearing the Men’s Long Sleeve Tennis Pullover in Twilight Blue and Aquamarine. The heat of the competition and the summer sun can get heavy. So don’t get bogged down with too many options and enjoy your pick at the cool, blue clothing options and combinations set up for you!